The Lewin-Cameron laboratory at the Peter Doherty Institute for Infection and Immunity recently commissioned and installed OpenSpecimen, a bioinformatics platform for managing biospecimens inventories. The system was developed by Krishagni Solutions in conjunction with the US National Cancer Institute and is distributed in Australia and New Zealand by AXT. The main focus of the Lewin-Cameron laboratory is to understand why HIV infection persists on antiretroviral therapy, to develop new strategies to cure HIV and to define the factors that drive liver disease in HIV-hepatitis B virus co-infection. 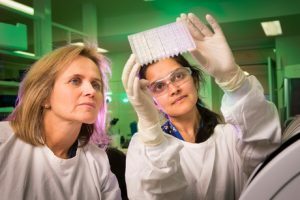 The laboratory collaborates extensively with researchers across Australia as well as the US, Europe, Asia and South Africa. With a geographically diverse user group and a library of over 100,000 specimens, the choice of a robust platform capable of dealing with the vast amounts of metadata was imperative. OpenSpecimen was found to be the most suitable solution for the lab’s requirements, enabling its researchers to concentrate more on research and spend less time on administration and record keeping. One of the features that was particularly attractive to the laboratory was the ability to customise the open-access OpenSpecimen software platform. “This meant we could quickly adapt to different study protocols, which can have varied collection and storage requirements,” Dr Chang said. The laboratory chose to directly involve Krishagni Solutions in this work and the data migration, with Dr Chang saying the developer was “very easy to work with”.